So, I’ve never done an official Meet the System post for Sega Master System. I will probably do that soon. For now, I just wanted to point out something that I found about the SMS’s audio. 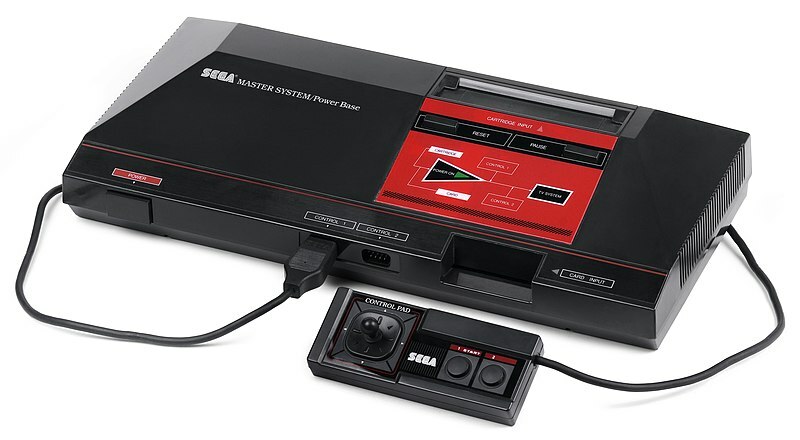 First of all, the Sega Master System uses a SN76489 Programmable Sound Generator (PSG). Yey, you can program sound! Lots of sounds! That sounds great. It is not. The SN76489 features 3 fixed square waves and a noise generator. The square waves cannot be changed via duty cycle. You’re stuck with them. To make matters worse, these square waves are incapable of reaching very low frequencies. The noise channel, on the other hand, is interesting; it is mildly toned. If you mess around with it, it can make scales and has noticeable pitch changes across octaves. The console used the SN76489 for ALL of its sound output. Oy. Have you ever experience the SN76489? Probably. The Sega Game Gear has the same chip inside. If you recall, most games had absolutely irritating high pitched sound effects (see: Sonic, Spin Dash, Game Gear). We only have the SN76489 to blame. So… side by side with it’s greatest competitor, the Nintendo Famicom/NES, how did our buddy the SMS stack up? Uh…. Not. Good. Wow. This is kind of why the Famicom/NES had 90% of the gaming market in 1988. BUT WHAT IF THIS COULD HAVE BEEN BETTER? AND WHAT IF IT WAS???? Whelp, we have Sega to blame for this. The Japanese Sega Master System contained the SN76489 AND the YM2413. So what, you say? The YM2413 contained 9 channels of FM synthesis. It could be adapted to “Percussion Mode”, which gave it 6 channels of FM Synthesis and 5 percussion channels. 11 more channels were possible! The chip had 15 preset FM Synthesis instruments and one user defined instrument. Does this sound familiar, at all? It’s the Konami VRC7! It’s the same chip, mostly. The VRC7 lacked the 5 percussion channels but was in essentially Percussion Mode (6 Channels of FM Synthesis). To make matters worse, this chip was STANDARD on all Sega Master System systems in Japan. The Sega Mark III, the console the Sega Master System is based on, actually had a special FM Sound Unit you could purchase and attach to get the better soundtrack! We did not receive ANY of this. This all makes me very sad. What do you guys think? This entry was posted on Friday, October 4th, 2013 at 1:09 pm	and tagged with Fantasy Zone, Fidelity Concerns, game music, gaming, master system, retro game music, Sega, Sega Mark III, Shinobi, video game music, video games, videogames and posted in Fidelity Concerns. You can follow any responses to this entry through the RSS 2.0 feed. This seems to prove one thing that remains true to this very day; its never the hardware that makes a good game system, but the software. I know one thing: parents of kids with the US SMS were much more likely to get extremely irritated while having to listen to the video games going on in the other room than their Japanese counterparts. I assume the reason for the lack of the VRC7 was that they wanted to spend less money making the US SMS? As far as squarewaves go, the SMS ones always seem to have a unique character, almost sort of “whiney”. Perhaps it’s just the lack of timbral variety, or something to do with the pitch resolution. The NES’s chip seems kinda limited, but in comparison, it’s a goldmine, with three different pulse tones, the stairsteppy triangle which let the bass cut through the mix, the two types of noise AND very crude sample playback. If the C64 taught us anything, it’s that game audio is incredibly important. Most of it’s games were pretty terrible, but we didn’t mind, because of the awesome music. Thank you for the link as well. I would definitely like to listen to it! Now, I DO like the YM2413 chip in the JP SMS as well. I hope to design music for it when Deflemask adds it as a tracker format. Phantasy Star 1 had some of the best music for both the JP and the US SMS tracks, as far as my preferences go. I practically BEGGED Delek to add it last update but he added the YM2151 – which I’m also okay with haha. Hopefully that happens and we get our 2 operator preset FM on~! Also, nice track!